A special space for tributes to the most important women in our lives. Mothers, grandmothers, nannies, teachers, friends – whoever they are, these are the women who inspire and guide us. Also listed in The Orchid Garden are the women who have been honoured by organisations and publications in annual awards. This 2003 Southeast Asian Games bronze medallist may have lost her arms and legs – but she will not allow herself to lose her passion for life. Getting herself fitted with bionic arms and legs has allowed this ex-SEA Games markswoman to resume training. 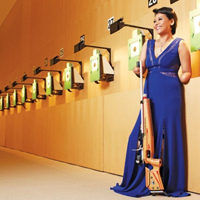 This September, Aishah participated in the 2015 International Paralympic Council Shooting World Cup in Sydney. And come November, she will travel to the US to compete. The never-say-die fighter has also set her sights on the Paralympic Games in Rio in 2016.